So, you want to motivate your employees during e-Learning. And who better than your training instructors or instructional designers to lead that motivation? One strategy is for instructors to lead e-Learning by applying the Path-Goal Theory. Where did Path-Goal Theory come from? 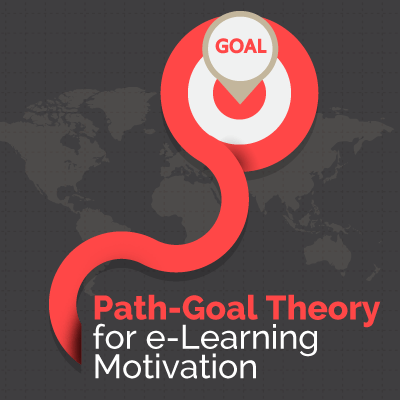 How does Path-Goal Theory apply to e-Learning? The instructor should set goals that challenge employees, which will encourage performance excellence. No childish questions or patronizing tone. This shows employees that you have faith in their achievement, which motivates them to follow through. Clarify specific expectations to employees regarding the e-Learning course and their future job performance. You can build these expectations into your course with learning objectives that provide clear direction. Create a friendly working environment by increasing employees’ self-esteem and making their jobs more interesting. For example, you can create more engaging training and reward learners along the way to support their effort. Listen to your employees’ ideas. For e-Learning, you can create a post-course evaluation. It’s a great way to find out what your learners liked and what they didn’t like, plus motivate employees with participative leadership. Now that you know a little about the Path-Goal Theory, you’re ready to motivate your learners. Add achievement-oriented, directive, supportive and participative leadership styles to your next online training program! Looking for an authoring tool to create that next e-Learning course? Try a free 30 day trial of Lectora® e-Learning software! For more psychology for e-Learning strategies, read this blog post: The Secret to e-Learning Success and Happiness: Flow.